Most of the processes listed are suited for gears with low wear requirements, low power transmission, and relatively low accuracy of transmitted motion . When the application involves higher values of one or more of these characteristics, forged or cut/machined gears are used. 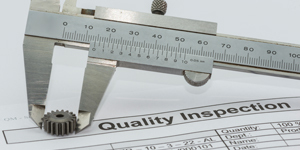 Table 1 lists the tolerances in terms of AGMA quality numbers for various gear manufacturing processes . 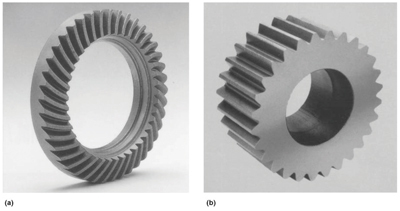 Although the casting process is used most often to make blanks for gears that will have cut teeth (Figure 1 and Figure 2), there are several variations of the casting process used to make toothed gears with little or no machining. 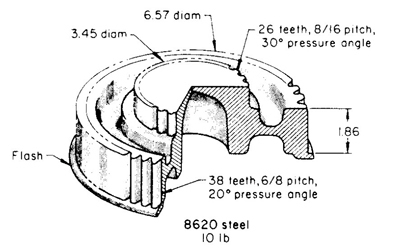 For example, cast-tooth internal gears (Figure 3) are produced in several sizes up to 1633 kg (3600 lbs). They are heat treated to strength levels of 689 MPa (100 ksi) and machining is not required on these gears. In circumstances where machining is necessary, the machining expense is reduced by casting closer to the final shape. 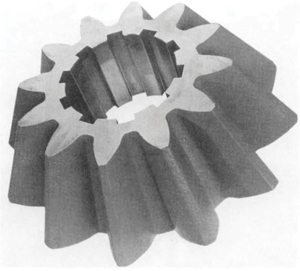 Another example of a cast tooth gear is the pinion gear produced from cast high-manganese (Hadfield) steel for an electric mining shovel shown in Figure 4. It was not necessary to machine the gear teeth. 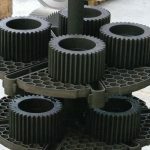 Most casting processes have been used to produce gear blanks or cast tooth gears including sand casting, shell molding, permanent mold casting, centrifugal casting, investment casting, and die casting. 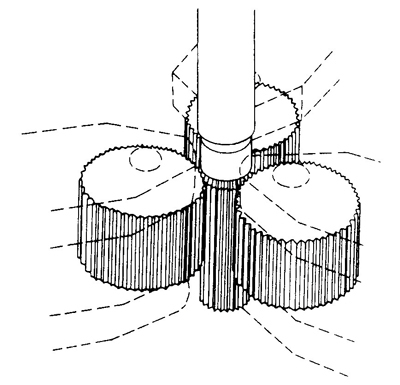 Cut gears have also been produced from continuously cast bars. 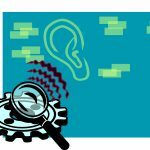 Some of the commonly employed processes will be briefly reviewed below. More detailed information on these processes can be found in “Casting, Volume 15” of The ASM Handbook. 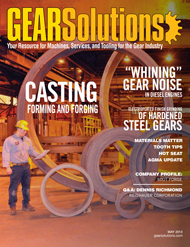 Sand casting is used primarily to produce gear blanks. 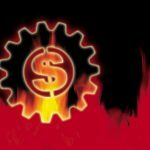 In recent times, there has been only very limited use of gears with teeth made by sand casting . In some instances gears for farm machinery, stokers, and some hand-operated devices have used cast teeth. The draft on the pattern and the distortion on cooling make it difficult to obtain much accuracy in cast iron or cast steel gear teeth. 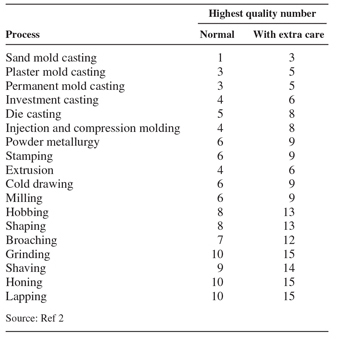 Table 1 shows that sand cast gears have the lowest AGMA quality levels of the major gear manufacturing methods. The greater dimensional accuracy offered by shell molding (as compared with conventional green sand molding) can reduce the amount of machining required for completion of the part. As-cast dimensions are not critical, but smooth surfaces (smoother than can be obtained by sand casting) are the primary objective. 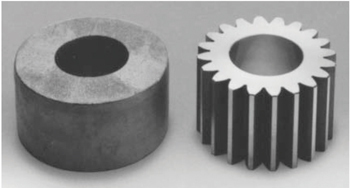 An example of a cast tooth bevel gear with an excellent surface finish produced by shell molding is shown in Figure 5. The investment casting process has similarly limited use in gear manufacturing. Its most apparent value lies in the making of accurate gear teeth from materials so hard that teeth cannot be readily produced by machining . 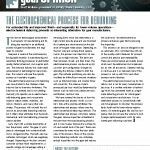 This process can be used with a variety of steels, bronzes, and aluminum alloys. 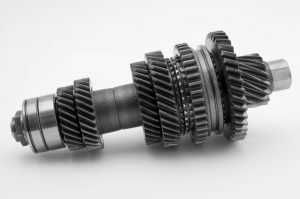 With machinable materials, the process is still useful if the gear is integral with some complicated shape that is very difficult to produce by machining. Large quantities of small, low-cost gears are made by the cold chamber die casting process (die cast gears are usually under 150 mm (6 in.) in diameter and from 10 to 48 diametral pitch (DP)). Complicated gear shapes, quite costly to machine, can be made quickly and at low cost by the die casting process. The main disadvantage of the process is that the low-melting point metals suitable for die casting—aluminum, zinc, and copper—do not have high enough hardness for high load-carrying capacity. Many different types of gears can be die cast, such as spur, helical worm, cluster, and bevel. 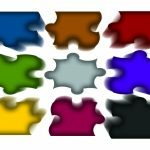 Applications for these types of gears include toys, washing machines, small appliances, hand tools, cameras, business machines, and similar equipment. Stamping is a metalworking technique that has been compared to using a cookie cutter. In this process, a sheet of metal is placed between the top and bottom portions of a die; the upper die is pressed into the lower section and “removes” or cuts the gear from the sheet. 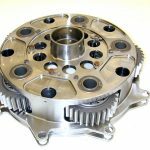 This is a low-cost, highly efficient method for producing lightweight gears for no-load to medium-duty applications. Stamping is restricted by the thickness of the workpiece and is used primarily for spur gears and other thin, flat forms . Stamped gears range in size from 20 through 120 DP and 0.25 to 3 mm (0.010 to 0.125 in.) thick . As the pitch becomes finer, the materials specification must become thinner. Table 2 shows recommended stock thicknesses for various pitches that are commonly used and require no special care in die maintenance. As shown in Table 1, tolerances for stamped gears are good, and AGMA quality class 9 can be achieved with extra care. A wide range of materials can be processed by stamping, including all the low- and medium-carbon steels, brasses, and some aluminum alloys. Nonmetallic materials can also be stamped. 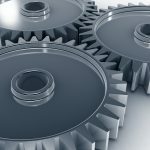 Gears manufactured by this process are used in toys, clock and timer mechanisms, watches, small appliances such as mixers, blenders, toasters, and can openers, as well as larger appliances such as washers and dryers. Fine blanking (also known as fine-edge blanking) is actually more akin to cold extrusion than to a cutting operation such as stamping. The process takes metal from a sheet like stamping; but differs from it in that it uses two dies and forms the workpiece by pressing it into the desired shape. The metal is extruded into the die cavities to form the desired shape. Also unlike stamping, fine blanking offers the designer a limited three-dimensional capability and can thus be used to create bevels, multiple gear sets, and other complex forms . 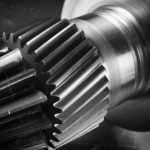 Fine blanked gears can be found in a wide range of applications including the automotive, appliance, office equipment, hydraulic, and medical equipment industries. 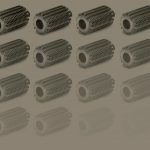 This process requires the least tool expenditure for mass production of spur gear-toothed gear elements and is extremely versatile, in that almost any tooth form desired can be produced. 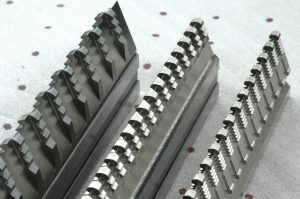 As the name implies, a bar is pulled (drawn) or pushed (extruded) through a series of several dies, the last having the final shape of the desired tooth form. As the material is run through these dies, it is actually squeezed into the shape of the die. Since the material is displaced by pressure, the outside surface is work-hardened and quite smooth. The bars that are “blanks” for this process are usually 3 to 3.7 m (10 to 12 ft) in length. After passing through the dies, they are known as pinion rods, and often are put into screw machines that finish the individual gears. Experience has shown that it is more economical to slice a segment off an extruded bar than to cut an individual gear. In some cases, it would be impossible to produce the desired shape of pinion any other way. Pinion rods from 16 to 100 DP can be obtained, but as the pitch becomes finer, it becomes more difficult to obtain the close tolerances that are sometimes desired on fine-pitch pinions. Any material that has good drawing properties, such as high-carbon steels, brass, bronze, aluminum, and stainless steel, may be used for the drawn pinion rod. Gears and pinions manufactured by this process have a large variety of applications and have been used on watches, electric clocks, spring-wound clocks, typewriters, carburetors, magnetos, small motors, switch apparatus, taximeters, cameras, slot machines, all types of mechanical toys, and many other parts for machinery of all kinds. Spur and helical gears, like splines, are roll formed (Ref. 1). 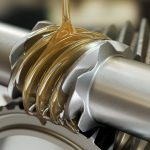 Millions of high-quality gears are produced annually by this process; many of the gears in automobile transmissions are made this way. 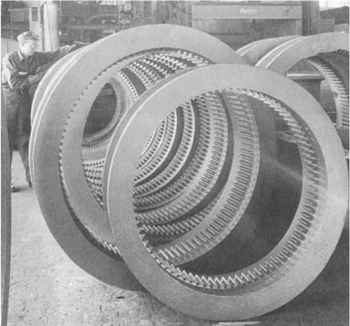 As indicated in Figure 6, the process is basically the same as that by which screw threads are roll formed, except that in most cases the teeth cannot be formed in a single rotation of the forming rolls; the rolls are gradually fed inward during several revolutions. Because of the metal flow that occurs, the top lands of roll-formed teeth are not smooth and perfect in shape; a depressed line between two slight protrusions can often be seen. However, because the top land plays no part in gear tooth action, if there is sufficient clearance in the mating gear, this causes no difficulty. Where desired, a light turning cut is used to provide a smooth top land and correct addendum diameter. Rolling produces gears 50 times as fast as gear cutting and with surfaces as smooth as 0.10 µm (4 µin.). Not only does rolling usually need no finish operation, but rolling refines the microstructure of the workpiece. Production setup usually requires only a set of rolling dies and the proper fixture to equip the rolling machine. By either the infeed (plunge) method or the throughfeed method, the rolling dies drive the workpiece between them, forming the teeth by pressure. Spur gears can be rolled if they have 18 teeth or more. Fewer teeth cause the work to roll poorly. Helical gears can be rolled with fewer teeth if the helix angle is great enough. It is usually impractical to roll teeth with pressure angle less than 20°. Lower angles have wide flats at root and crest that need more pressure in rolling. Lower angles also hinder metal flow. Although 0.13 mm (0.005 in.) 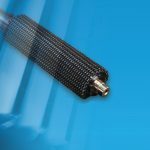 radius fillets can be rolled, 0.25 mm (0.010 in.) is a better minimum. For greater accuracy, gear blanks are ground before rolling. Chamfers should be 30° or less. 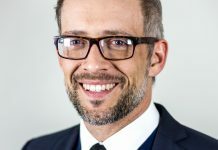 Steels for gear rolling should not have more than 0.13% S and preferably no lead. Blanks should not be harder than 28 HRC. Forging has long been used in the manufacture of gears. This is particularly true for the production of gear blanks, which would subsequently be cut/machined into the final desired configuration. 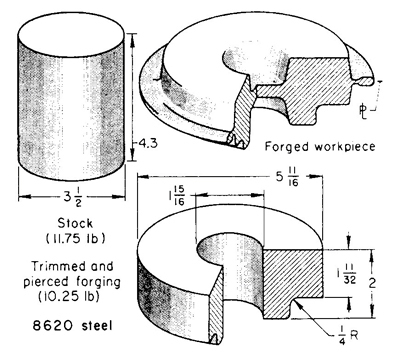 Gear blanks have been produced by open-die forging, closed-die forging (Figure 7), and hot upset forging. 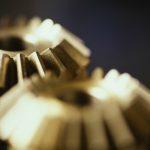 During the past 35 years, there has been considerable research and development aimed at producing near-net or net-shape gears by precision forging. Today, precision-forged gears requiring little or no finish machining are commonly used in the automotive, truck, off-highway, aerospace, railroad, agriculture, and material handling industries, as well as the energy and mining fields. 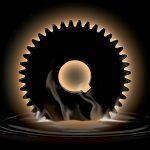 One of the first forging processes for manufacturing near- or net-shape gears was the high energy rate forging process, which is a closed-die hot or cold forging process in which the work metal is deformed at unusually high velocities. Ideally, the final configuration of the forging is developed in one blow, or at most, a few blows. Velocity of the ram, rather than its mass, generates the major forging force. 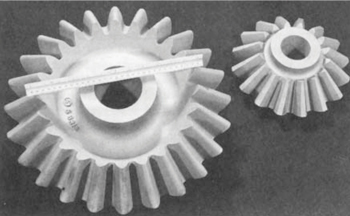 It is possible to produce gears with a contoured grain flow that follows the configuration of the teeth using high-energy-rate forging. In the case of spur gears, this is achieved by pancaking to cause lateral flow of the metal in a die containing the desired tooth configuration at its periphery. Contoured grain increases the loadbearing capacity without increasing the tooth size. 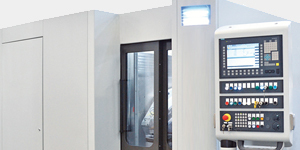 In addition, the process minimizes the machining required to produce the finished gear. Although spur gears are the easiest to forge, helical and spiral-bevel gears can also be forged if their configurations permit ejection of the gear from the die cavity. Gears have been forged from low-alloy steel, brass, aluminum alloys, stainless steel, titanium, and some of the heat-resistant alloys. Gears with a DP of 5 to 20 are commonly forged with little or no machining allowance. The die life decreases significantly when forging finer-pitch gears. The forging of 5-DP gears with an involute tolerance of 0.013 mm (0.0005 in.) and a total composite error of 0.08 mm (0.003 in.) has been reported. 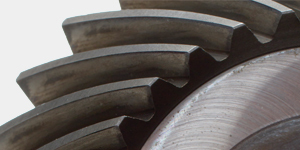 These gears were forged with a tooth-to-tooth spacing deviation of about 0.025 mm (0.001 in.) and a total accumulated deviation of 0.089 mm (0.0035 in.). Over-the-pins dimensions were held to ±0.05 mm (0.002 in.) on these gears, and the total composite error was about 0.20 mm (0.008 in.). Holding gear dimensions to extremely close tolerances may eliminate finish machining, but the savings may be exceeded by higher die making/maintenance costs. Consequently, most forged gears have an allowance for machining. A surface finish of 0.5 to 1.5 µm (20 to 60 µin.) on gear teeth is practical. However, even with a 0.5 µm (20 µin.) finish, local imperfections can increase the average to 1.5 µm (60 µin.) or greater. Therefore, it would be difficult to maintain a good surface finish on gear teeth without grinding. 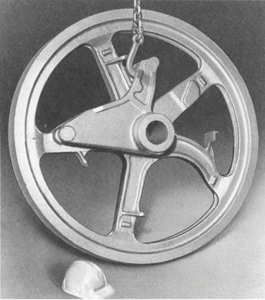 The 4.5 kg (10 lb) gear shown in Figure 8 was forged from 8620 steel billet 75 mm (3 in.) in diameter by 124 mm (4.9 in.) in length. An energy level of 353,000 J (260,000 ft · lbf) was needed to forge the gear in one blow at 1230 °C (2250°F). The web on the gear was forged to final thickness; the teeth were forged with 0.51 mm (0.020 in.) of stock for finish machining. The die inserts originally used to forge this gear were made of H11 or H13 tool steel. This steel typically softened after producing 20 gears because of its temperature rising above the 565°C (1050°F) tempering temperature of H13 steel. The use of Alloy 718 (UNS N07718) was found to improve the die insert life. 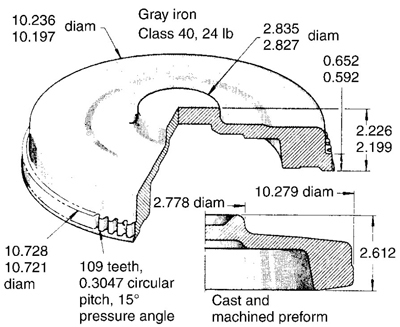 The automotive flywheel shown in Figure 9, 272.49 mm (10.728 in.) in diameter over the teeth and weighing 11 kg (24 lb), was forged from a machined blank cast from class 40 gray iron (generally considered unforgeable). 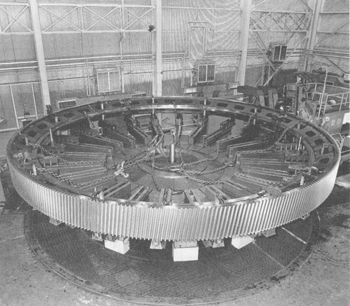 The machined preform, a section of which is shown in Figure 9, was heated to 955°C (1750°F) and forged at an energy level of 271,000 J (200,000 ft · lbf). This part had the smallest tolerance specification. The diameter over the teeth and the thickness of the body had a tolerance of +0.00 mm, -0.18 mm (+0.000 in., -0.007 in.). The largest tolerance on the part was ±1.02 mm (±0.040 in.) on the diameter of a recess. Tolerances on the other recesses were ±0.18 mm (±0.007 in.) and +0.48 mm, -0.00 mm (+0.019 in., -0.000 in.). This gear was forged to the finished dimensions. Various gears with teeth as an integral part have been forged. These have ranged in outside diameter from 64 to 267 mm (2.5 to 10.5 in.) and in weight from 0.54 to 11 kg (1.2 to 24 lb). Most have been made with 0.13 to 0.51 mm (0.005 to 0.020 in.) of stock on the flank of each tooth for finish hobbing and grinding. Gears forged with integral teeth normally have longer fatigue and wear life than those made from a conventionally-forged blank on which the teeth are hobbed, shaped, or milled. The term “precision forging” does not specify a distinct forging process but rather describes a philosophical approach to forging. The goal of this approach is to produce a net shape, or at least a near-net shape, in the as-forged condition. The term net indicates that no subsequent machining or finishing of a forged surface is required. Thus, a net shape forging requires no further work on any of the forged surfaces, although secondary operations may be required to produce minor holes, threads, and other such details. A near-net shape forging can be either one in which some but not all of the surfaces are net or one in which the surfaces require only minimal machining or finishing. Precision forging is sometimes described as close-tolerance forging, in order to emphasize the goal of achieving, solely through the hot forging operation, the dimensional and surface finish tolerances required in the finished part. In recent years, computer-aided design and manufacturing (CAD/CAM) techniques have been applied to various forging processes . This computerized approach is applicable to precision hot forging of spiral bevel, spur, and helical gears in conventional presses in that it allows the die designer to examine the effects of various process variables (loads, stresses, and temperature) on the die design. Precision hot-forged gears have the same advantages over cut gears as other molded gears (cast, P/M-processed, injection-molded) in that there is little or no material lost (Figure 10). This is cost-saving from the standpoint of both the cost of the material itself and, more importantly, the cost of machining. 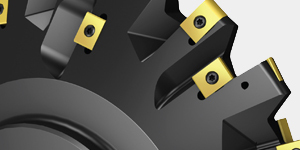 In addition, precision-forged gears also have the advantage over cut gears of increased load-carrying capacity. This added strength in the form of increased fatigue strength is due to the difference in grain flow between gears cut from bar stock and forged gears. The grain flow in cut gears is determined by the hot rolled orientation of the bar stock and has no relationship to gear tooth contour. On forged specimens, the grain flow follows the tooth contour in every gear tooth. 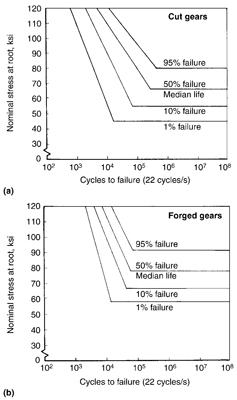 Figure 11 compares the fatigue properties of cut and forged gears . 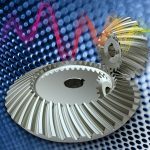 The majority of forged gears produced today are near-net shape configurations. Gear teeth are forged with an envelope of material (stock allowance) around the tooth profile. This envelope is subsequently removed by the forging house or the customer purchasing the forged gears. The manufacturing process begins with steel bar stock, usually turned and polished to improve the surface, and cut to the exact weight. The exact weight is critical because the amount of steel must completely fill the die to produce the complete gear profile. Prior to forging, billets are heated between 925 and 1230°C (1700 and 2250°F) in an electrical induction furnace that is controlled by an optical pyrometer to ±14°C (25°F). In a single stroke, standard mechanical forging presses, ranging from 14,235 to 53,375 kN (1600 to 6000 tonf), form near-net shape gears with the complete allowable stock allowance. The purpose of this first operation, which forms a “pancake,” is to break the scale off of the billet and size the outside diameter to just under the size of the root diameter in the gear die. Next, an operator positions the billet into the finish die. Spur gears with a 0.1 to 0.3 mm (0.004 to 0.012 in.) stock allowance can be produced up to 250 mm (10 in.) in diameter and up to 150 mm (6 in.) maximum face width, with a 0.1 to 0.3 mm (0.004 to 0.012 in.) stock allowance per flank. A pitch range of 4 to 12 DP can be achieved. This type of gear requires a finish process of grinding or skiving. A net root is possible. joined ASM in 1980 as an editorial assistant. By 1989, he was manager of ASM Handbook development. In 1991, Joe left ASM, but continued to work for the Reference Publications Dept. 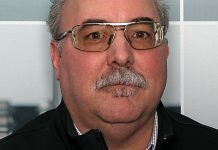 as an independent contractor until his untimely death in 2007 at age 53. 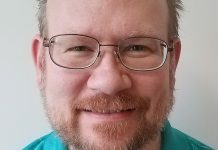 As a freelancer, he edited at least 22 ASM books, including eight ASM Specialty Handbooks, the ASM Materials Engineering Dictionary, the second edition of the Metals Handbook Desk Edition, and three books on corrosion. 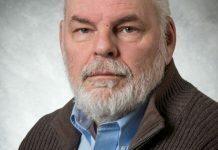 As an ASM staff editor, he was significantly involved in the editorial development of the Metals Handbook, 9th Ed., Volumes 6–17, and the Engineered Materials Handbook, Volumes 1–4.ASM, celebrating its 100th Anniversary in 2013, is a society dedicated to serving the materials science and engineering profession. 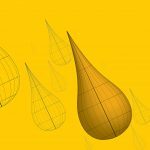 Through a network of 36,000 members worldwide, ASM provides authoritative information and knowledge on materials and processes, from the structural to the nanoscale. For more information, visit www.asminternational.org.